As I mentioned in my clothing roundup posts from last year, I feel like my closet is in a pretty good state. I can go through around three weeks without doing laundry and everything feels comfortable and just chic enough for casual situations and work. There is no absolute need requiring me to buy clothes for the next few months. That said, sometimes it’s nice to window shop. Imagining what I could buy is like 75% of the enjoyment of actually purchasing an item. And with the internet, that’s easier than ever. I’ll probably have this as a series up here every once and a while to vent some of the idle shopping feelings. No links– affiliate or otherwise. I’m not trying to push anyone to spend where they otherwise wouldn’t. After Xin’s post about these, I’ve been really itching to buy them for work. Imagine it: slacks but with an elastic waist band. And a loose comfortable fabric that breathes. My heart skips a beat just thinking about it. I think I can probably pull it off if I don’t tuck in my shirt, the elastic band look would not go over well with my supervisors. I also like the texture, a nice suede-looking crepe de chine. So often my modus operandi has been to use blouses as the interest piece, but it’s interesting to consider flipping the script. A crisp white button up with silk ankle pants? I can dig it. One of the reasons I would buy Everlane clothing so much is that– barring their general problems with quality, their color game is just so on point. I am not into saturated jewel tones, so the muted colors suited me well: forest greens, brick reds, powder pinks. Grana, on the other hand, has much brighter colors: mint blues, fresh leaf greens, lavenders so vibrant you can almost smell them. It’s not loud exactly, but starting to speak in an outside voice. The one color I cannot get enough of in Grana’s catalog is this coral though. Classic and cute. And the cut of this dress is just so gently flirty and versatile. I feel like it’s a very lady-in-a-commercial dress. She’s eating a picnic on the beach, twirling in the sunlight, stops by the cafe for a croissant on the way home. She reminds you that you’re young and vibrant, and that maybe you should have something in your closet that makes you feel pretty instead of put together. As you can tell, I’m weirdly emotionally invested in this dress. Take all my thoughts about the coral dress and apply it to these shorts. Completely impractical for my life, but also overwhelmingly cool. I like the idea of an all-silk outfit on a summer’s night. Clothes so light and breathable I can barely tell where I end and nature begins. 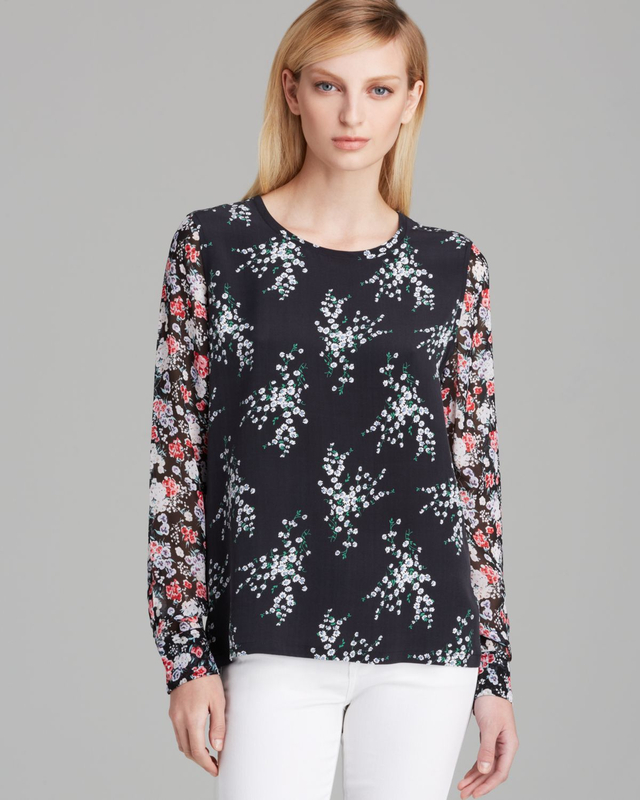 Maybe it’s the three days of 50 F weather (after a week hovering near zero plus a bomb cyclone), but I’ve been really crushing on the florals lately. I love the contrast between the front and the sleeves. A blouse of just the sleeve textile would be too loud, of just the front too dowdy. This feels the right amount of off-kilter. I’ve been searching for a pair of minimalist black linen pants for about two years. Lo and behold everything Elizabeth Suzann. I feel late to the game on this but I really like the lack of adornment on her clothing. It looks simple but versatile. But so expensive with a limited secondary market where clothes cost nearly as much as they are new. Anything you’ve been window shopping lately?